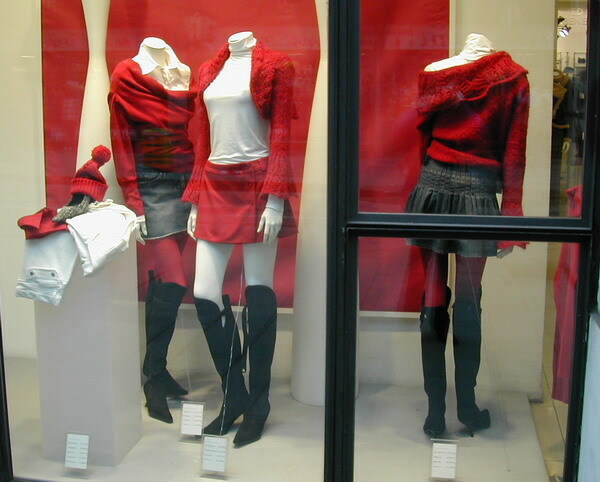 Last Christmas season (Dec 2004) our teen expert, Ross, took me out to see where the cool young people shop in Milan. The Calzedonia chain features socks, stockings, lingerie, and swimwear. All over the city. Fornarina – very in, but also expensive (even their graffiti matches). We continued down via Torino, past the Colonne di San Lorenzo, to Porta Ticinese (the big archway you see in this photo – one of the gates to the medieval city). Beyond is Corso di Porta Ticinese, full of interesting, funky boutiques as well as chain stores. Some of our favorites are the shops featuring hand-made clothing and accessories of bright Asian silks. …and strolled over to the “Golden Quadrilateral” – bounded by via della Spiga and via Montenapoleone, this is the high-end shopping district. It’s fun to look at the gorgeous window displays, even when you can’t afford anything! This entry was posted in Italy travel and tagged Italy travel on November 20, 2005 by Deirdre Straughan. For babies and younger kids, there’s a great shop near the Arco Della Pace and Sempione Park: Apple Pie. It has really original clothes, gifts and toys.